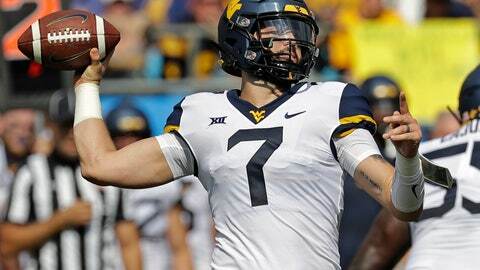 Grier broke the middle finger on his throwing hand when he dove for the end-zone pylon in the Mountaineers’ 28-14 loss to the Longhorns in Morgantown. Gone was the chance for a 10-win season and perhaps eclipsing several single-season records for Grier. He missed the rest of that game and the next two, including a bowl, and West Virginia lost all three to finish 7-6. His 34 TD passes still were second best in school history and his 3,490 passing yards were fourth best. Grier will face a hostile Texas crowd in his only trip to Austin, Texas, on Saturday when West Virginia (6-1, 4-1 Big 12) plays the Longhorns (6-2, 4-1). Both teams share first place with Oklahoma (7-1, 4-1). There’s no need to look back to the injury for additional motivation. Grier had driven West Virginia to the Texas goal line in the first quarter last year. From the 1 he faked a handoff to Justin Crawford, kept the ball and headed to his left. He stuck the football out toward the pylon but lost the ball. His throwing hand hit the turf with defender Brandon Jones on his back. His finger bent, Grier got up and jogged toward the bench, his season over. After undergoing surgery, Grier announced a month later he would return for his senior season rather than enter the NFL draft. Grier has drastically scaled back taking off with the football this season, although he still has the green light to run. His throwing ability continues to impress. Grier is completing 70 percent of his passes and is averaging 325 yards per game, second in the league to Texas Tech freshman Alan Bowman. His 25 TD passes are second in the Big 12 to Oklahoma’s Kyler Murray. Grier had some problems getting the Mountaineers into the end zone early in the Big 12 schedule and he’s been sacked 19 times, more than all of last season. After a 30-14 loss at Iowa State, Grier bounced back with three touchdown passes and he ran for a 1-yard TD in a 58-14 win over Baylor last week. If Grier has fallen off some prognosticators’ lists of Heisman Trophy hopefuls, Herman has him back on it.